Unit provides guidance, data logging, application reports and steering. 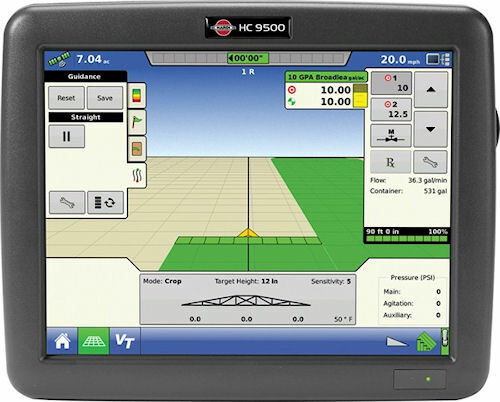 Ag Leader Technologies, Inc., and global sprayer manufacturer Hardi International A/S are collaborating with the new HC 9500 Controller for select sprayers operating on Hardi's ISOBUS system. The new controller is incorporated with Hardi's i-Features, and provides growers with precision guidance, data logging, application report generation, automated steering and more. The HC 9500 also offers compatibility with the ISO 11783 (ISOBUS) Virtual Terminal Standard and the NORAC UC5 boom height control system support. Expect availability during the last quarter of 2011. The HC 9500 controller is the heart of a recent collaboration between Ag Leader Technology, Inc., and sprayer maker Hardi International A/S -- on selected Hardi ISOBUS sprayers. Hardi, with roots in Denmark from 50 years ago, is a world leader in sprayers from hand-operated units of 1.5 L capacity to self-propelled machines capable of holding nearly 2,500 gallons. Ag Leader is an Ames, Iowa, firm widely known for its precision agriculture technology and design. For more information on the new tool visit www.agleader.com.